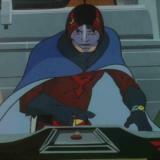 Gatchamania.net - Happy 40th anniversary Battle of the Planets! Gatchamania.net »[Speak Up!] »General Discussion » Happy 40th anniversary Battle of the Planets! Thanks for the, uh... enthusiasm as always, Zark. Yes indeed - Happy 40th anniversary, Battle of the Planets! The series has already passed a number of significant milestones - but this year, this very day in most cases, it turns 40! From the beginning, Battle of the Planets was conceived as a Star Wars for television - meant to capture the same type of young audience that was riveted by the film's massive success. 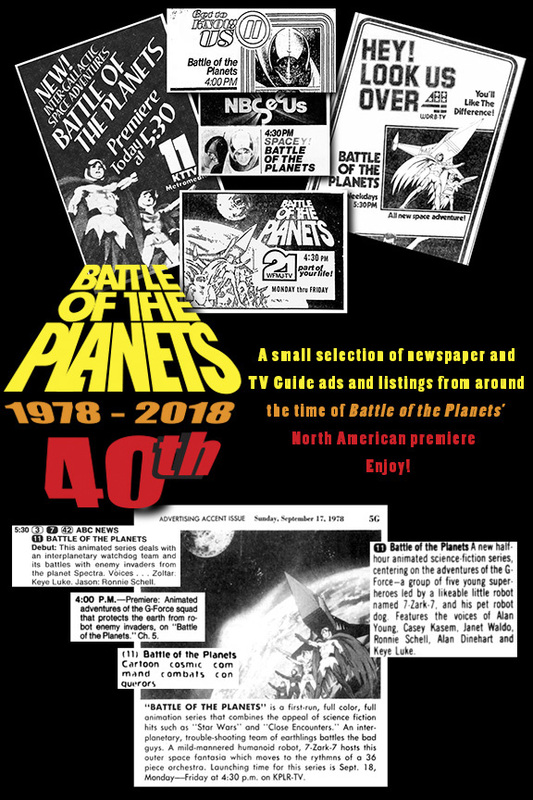 In North America, most major markets began airing Battle on September 18, 1978 with the episode "Giant From Planet Zyr." No matter when people saw it nor in what order, Battle left a lasting impression that created scores of fervent fans. Each had their own way of appreciating the series - some got together to play G-Force, dressed as characters for Halloween, watched episodes in groups, talked about it at school, rolled their eyes at the latest "Zarkisms," recorded it from their televisions on audio cassettes, investigated the deeper story of its origins, drew endless pictures or scoured stores for toys and comics. Plus the time was tight. Excluding the pilot, which was completed in early 1978, Battle was produced from May of that same year through January, 1979. This meant a lot of work for the staff and cast in the same time frame as a normal television production period. In an era where Saturday morning cartoon seasons yielded about 12 new episodes, and primetime series about 24, Battle produced 84 (85 total including the pilot). It was a ton of involved work in a very compressed period. It all came across in the final product. There was simply more going on with the G-Force team than in things like Super Friends. They had incredible, thrilling adventures on Earth and through outer space on alien planets (congratulations Sandy & Co., I bought that angle without question!) But they still felt like real people. People that went through wide ranges of believable emotions and had some depth to their characters. The art, music and acting were all equally as engaging. Although in the end, it was those interesting characters together with the fun stories that stuck in viewer's minds and left them wanting more. Battle's somewhat mysterious nature encouraged fans to seek out others to find answers through early fan club newsletters, a still-active Amateur Press Association (APA) publication named Bird Scramble!, and later a thriving online community of websites and mailing lists. Each gave fans more ways to express themselves and share their attachments to the series, but more importantly allowed many to find lifelong friends and some even the loves of their lives. Not a bad legacy for a series that some dismiss as less important than later anime-based titles. Without question, Battle opened the gates for the second wave of Japanese animation in North America - which is still ongoing. Had Battle not been produced, most of the "more important" later Japanese animation-based series may never have found homes in the US. Sure, someone else may have come along to develop the first weekday Star Wars for television, but they may not have necessarily looked to Japan, existing content, nor animation to do it. What a great collage, Jason! 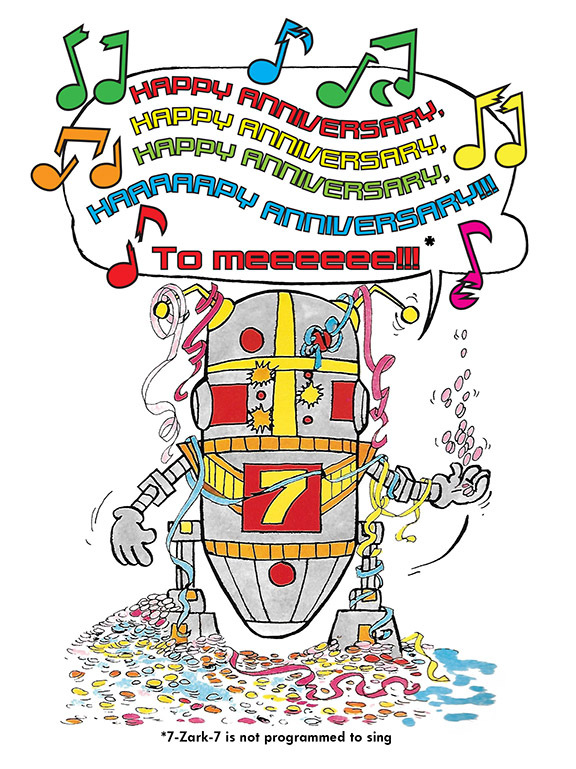 And here's a toast to BoTP, may it inspire many more generations to come! This post has been edited 1 time(s), it was last edited by Daniella T on 18-09-2018 at 06:06. Thanks James for the history of the BOTP!! I'm wondering how much of a conclusive series they'll give the new production of it. That will be interesting too see. Gtachamania deserves a mention in there too in the history, it has a lot of the fandom base and information stored on this site. This post has been edited 1 time(s), it was last edited by Ebonyswanne on 18-09-2018 at 23:52. It's so hard to believe it been 40 years. I was one of those who recorded the episodes on cassettes and then wrote them down. Unfortunately, they got lost as some point. There might be some surprises coming? Fingers crossed. I wish I could have captured episodes on cassette when I was young. I didn't have a portable recorder until I was in my teens. Shortly after getting addicted to Battle, my family moved to an area that didn't air it. It was many, many years until I finally found someone with some film transfers on VHS at a comic convention. A box full of audio cassettes would have kept me good company through those years, and probably have gotten played to the point of erasing the recordings! I tried too record them at one point, but dad taped over them all the time. This page was generated in 0.164 seconds (57.34% PHP - 42.66% MySQL) with 33 queries.